When winter comes and the ground is covered with snow fire lighting becomes harder. As long as the snow I powdery the best thing is to dig down to ground. But during the winter things change and rain or warmer weather can come on and if it gets cold again the snow will freeze hard. Making a fire the normal way were the fire makes it way up can be a problem winter time since ice and snow on the firewood will melt and run down and put a small flame out, this way you don’t get that problem. 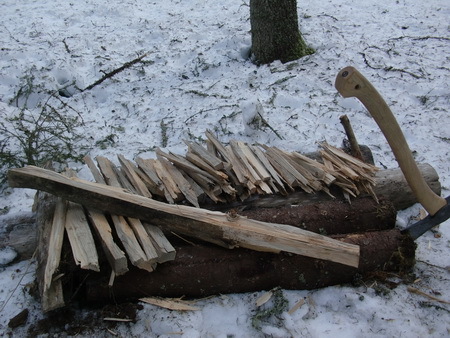 A friend and me did a one like this with fresh birch logs one winter and it burned for a long time and left a massive pile of hot embers that kept us warm for many hours making it a good fire when you want coals for cooking. I always bring an axe with me out in the woods and especially wintertime, it makes things so much easier and quicker. Here the snow is so hard you can walk on it but still 30-40 cm deep. 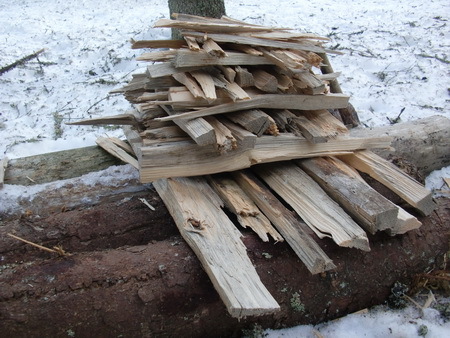 I found some old logs I use as a base, the logs will also work as my chopping block. 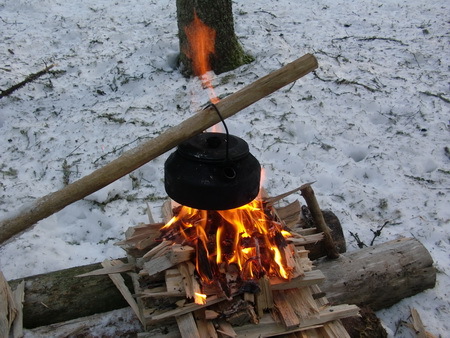 Best is to use something that not burns really well like fresh pine, but you use what you got. I have then split up a dead standing pine. I do this by splitting the log in four pieces,this makes it easier to cut them in shorter pieces. This is an old technique that was used in the past when people did not have any saws. Then it´s just splitting some pieces down to really small, bigger and bigger, just like you would do when making a step by step fire. 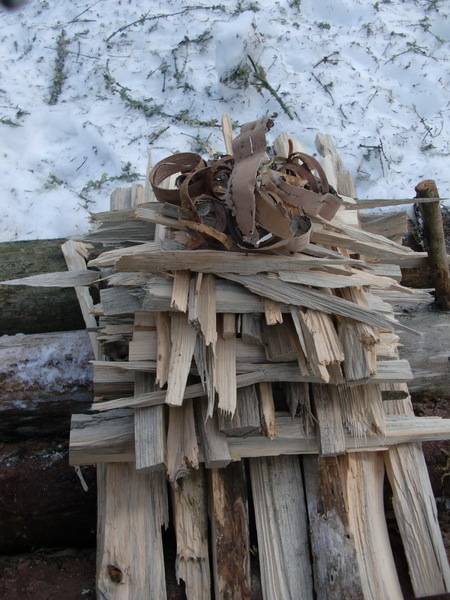 Then it´s time to start piling all the sticks up, starting with the thicker pieces first and then smaller and smaller and on top a bunch of birch bark. 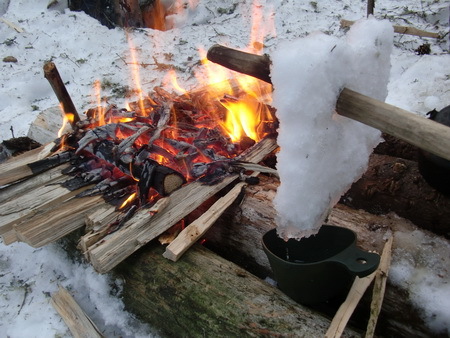 Why not melt some snow so you can have more coffee later (Finnish marshmallow). This is the fire after 30 min and I have not touched it since I lighted it, now it has some nice coals and it´s no problem to put on me firewood to keep it going for a longer time. Even the logs have started to burn slowly. Detta inlägg postades i Nature, Ute och omkring den januari 27, 2011 av Johan, Nordic Bushcraft. Thanks Johan, this was a very useful and timely post!